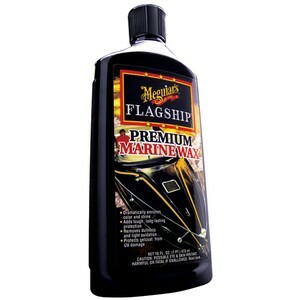 Meguiar's Flagship Premium Marine Wax is designed to enrich the colors and shine of your boat's fiberglass and gel coat surfaces. Meguiar's Flagship Premium Marine Wax is designed to enrich the colors and shine of your boat's fiberglass and gel coat surfaces. This premium boat/marine wax is very effective at removing light oxidation and dullness, restoring a gloss, and then adding protection against the sun's harmful UV rays. Be sure to only use this wax after your boat's surface has been cleaned and restored to a like new or average finish.